​One of Brisbane's most accomplished and under-rated heavy bands, Apate, are today announcing their brand new EP, Spit You Out and rolling out their tour dates to go with it, a triple threat release tour alongside Scourge and Vaela. With a specific focus on catchy riffs, insanely heavy breakdowns and unique, catchy vocals, Apate feels they have ticked these boxes and more with their highly anticipated release of their second EP Spit You Out, which will see its release on Friday 25th August - the tour starts the same day in Sydney. As a five-piece nu-metalcore band, Apate has played shows at a number of exciting events and venues up and down the east coast. The band came together four years ago on the bayside of Brisbane and after a few member changes have settled on a dynamic lineup of like-minded artists, making them a quickly rising force. Apate put an emphasis on their live shows, with their dynamic and energetic stage presence setting them apart from the sea of Australian metal bands. Some of their shows include: Opening for Parkway Drive at Live it up Festival, a sold out Labwave 2016, Moshfest 2016 & 2017, Kill All Your Friends Festival IV. Also on their list of stand out shows are supports for numerous high level bands such as I, Valiance, Saviour, Prepared Like A Bride, Ocean Grove, Alpha Wolf and Aversions Crown, not to mention countless headline shows. On top of their many Brisbane appearances, Apate are also not newbies to traveling the country to expand their horizons and play to different audiences. As a whole, Spit You Out explores the dark and very real times that almost everyone goes through at some point in their life. Each song takes the listener on a different path of emotion and sets a different mood. The lyrical and instrumental components are drawn from first hand and very real personal experiences that members of the band have been in, around, endured and seen affect both themselves and those around them. Although the record is sinister, and at times very confronting, it's purpose is to reach out to anyone who listens and let them know that no matter how they feel, what they've been through or are going through at the time, that they are never alone. There are millions of people out there experiencing life in a very similar way. A nostalgic feeling is experienced throughout Spit You Out as nods to 90's and 00's nu-metal and grunge constantly remind the listener of the types of bands that shaped and influenced each member of Apate. Along with this, a unique take on the modern breakdown coupled with extremely low tuning makes for punishingly heavy sections that will shake a room when performed live. Caleb Patch, guitarist of Apate wants people to know that the release is close to their hearts and that their effort and passion is evident in the record. "Spit You Out is lyrically and instrumentally our most in depth release to date. This record is our everything. It was written and recorded from a place of raw emotion. It's two years of our time, energy, emotion, blood, sweat and tears compiles into seven tracks; 19 minutes of audio". The EP was engineered/recorded by Dan Field at Skull and Bones Records, Mixed and Mastered by Cody Stewart at Reforce Media and the awesome Artwork is by Drömsjel. Spit You Out is out Friday August 25th in iTunes, Spotify and all good online stores and can be pre-ordered from this Friday 28th July. 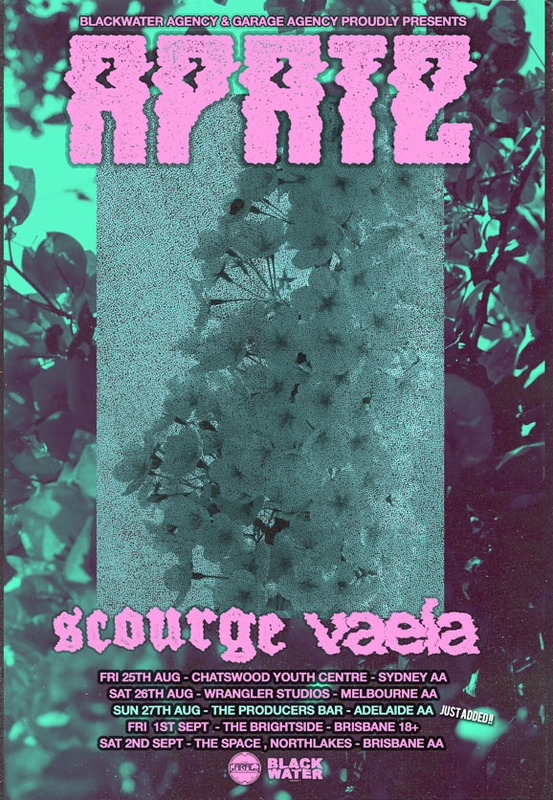 The Triple Release tour, featuring Apate, Scourge and Vaela starts on the 25th August in Sydney and features all ages shows in Sydney, Adelaide, Brisbane (18+ and AA) and Melbourne.